I seem to be making quite a lot of ice cream and sorbets this season. The weather definitely calls for it but I also find it a very fun and delicious medium for so many different flavors and textures and combinations. We've enjoyed saffron in paella, bouillabaisse and in some desserts. It's such an intriguing and elusive spice, the tiniest pinch goes a long way. Saffron traces back to ancient Mediterranean civilizations where it was used as a perfume, medicine, dye and divine offering. It also flourished throughout Asia and found its way to Pennsylvania in the 1700s by way of Europe. Iran, Spain and India are now the major producers, with Iran producing the most intense variety. This ice cream is one of my favorites. It’s rich without being heavy, very flavorful without being extreme and incredibly soothing and satisfying. It contains no eggs and does not require the making of custard. The ingredients are simply whisked together and chilled. It’s a cinch to make. I also happened to have some super ripe figs that were just about ready to blow so I made an orange gastrique and served the ice cream with drizzled figs. Very, very end-of-summer-ish. Get your saffron on! - Buy saffron in small quantities, pack it in an airtight container and store in a cool dark place. Bring the cream to a slow simmer, take off the heat and add the saffron threads to bloom the flavor. Cool the saffron cream. Whisk the saffron cream and buttermilk together. Add the sugar, pinch of salt and the lemon juice, to taste. Adjust the sugar to your taste if you'd like a sweeter ice cream. Chill thoroughly, preferably overnight. Freeze according to your machine’s instructions. Pour into a clean airtight container. Put a piece of plastic wrap on the surface, cover and place in your freezer to firm up. Combine orange juice, sugar and vinegar in a saucepan over medium heat. Bring just to a boil and reduce, turning the heat down to medium-low. Continue cooking until it thickens and is reduced by about half. The mixture will continue to thicken as it cools. 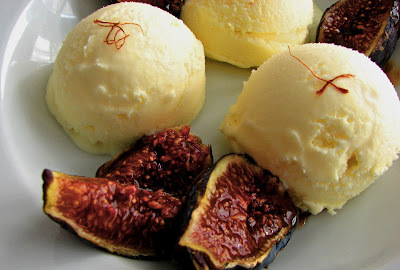 Those figs look absolutely magical! 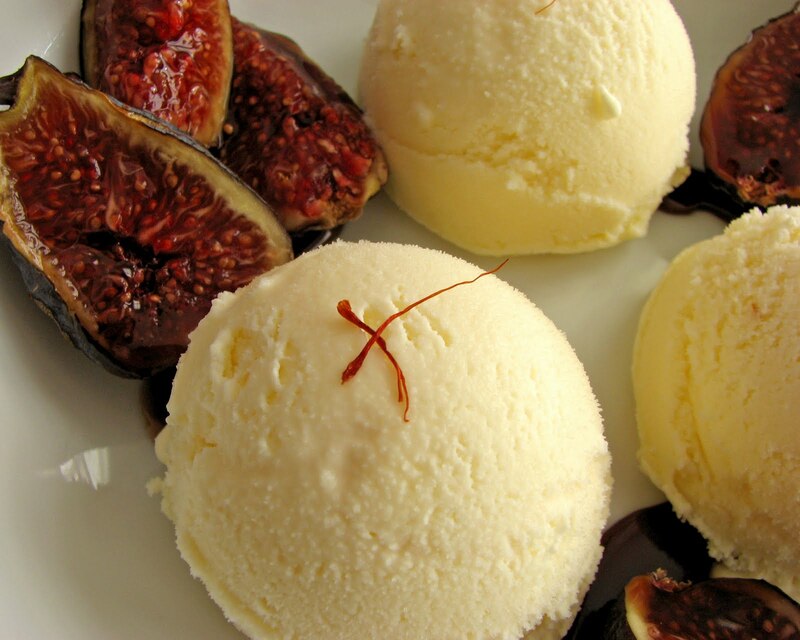 Ice cream really is the perfect medium for playing with flavors! This is my kind of ice cream. Ive never had anything like it but just the flavour infusions within make me drool! Yum! just hearing orange gastrique makes me crave this. so refreshing with the aromatic saffron! You don't see saffron ice cream very often, but I had some saffron kulfi once that was very tasty. 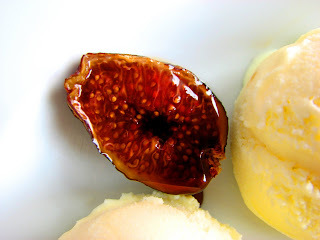 Figs would taste wonderful with it! Gah - I love saffron & orange (aioli, gelato, ANYTHING). this looks fantastic! Your photography is amazing! It's making me hungry! Thanks for Sharing.